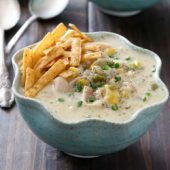 Flavor packed slow cooker creamy white chicken chili with cheddar cheese. A hearty meal, perfect for cooler months! To the bowl of a 5-6 quart slow cooker, add chicken, vegetables, beans, seasonings, bay leaves and broth. Cover and cook on high for 4 hours, or on low for 8 hours. When the initial cook time is up, remove and discard bay leaves. Remove chicken breasts and shred with forks, set aside. Add cheese to slow cooker, stirring until melted. Combine heavy cream and flour, whisking until smooth. Add heavy cream mixture to slow cooker, stirring gently until combined. Return shredded chicken to slow cooker. Cover and continue cooking for an additional 30-45 minutes or until desired thickness is reached. Serve warm with seasoned tortilla strips, chopped green onions and a dusting of ground black pepper. Serve with baguette slices on the side. Gluten free option: substitute 1 1/2Tb cornstarch for the flour.